Le Chahut is an oils on canvas painting by the Post-impressionist French painter, Georges Seurat, completed in 1890. The painting is part of the collection of the Kroller-Mueller Museum, in Otterlo in the Netherlands. It is quite a large work, measuring 66 1/8 by 55 1/2 inches. The painting features a small troupe of dancers, two males and two females, executing a high kick. The viewer’s perspective is from behind the orchestra’s bass player. The conductor and other members of the orchestra are visible to the left of the painting, and several members of the audience are also shown to the rear. At the bottom right-hand corner, a man with very pronounced features, reminiscent of a satyr, is shown. The scene is of a cabaret or music hall venue, rather than an opera or ballet, making it a work that depicts working class entertainment. Seurat was the first artist to use pointillism in his work, and La Chahut is done using this method. 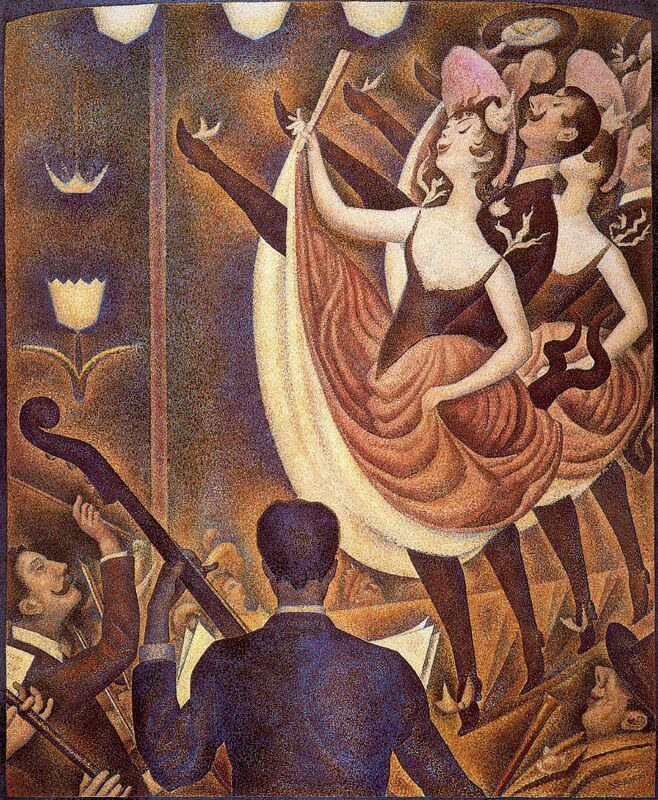 The work also explores Seurat’s deep interest in the connections between light, physical form and emotion.